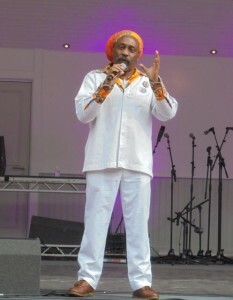 Jamaica was represented for the first time at Glasgow MELA Festival with dub poet Yasus Afari and reggae singer Claudius England performing before an appreciative audience at the bandstand stage. Between them they brought powerful messages about care for the earth and unity. 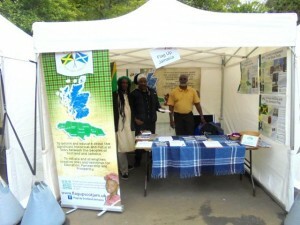 Both artists were sponsored by Flag Up Scotland Jamaica who also had a stall at the festival where posters about the special connections between Scotland and Jamaica could beviewed. 200 people also signed a petition urging the Scottish Government to grant Jamaica prioritystatus for trade and development. After the MELA Festival, Claudius was able to stay in Scotland for a number of engagements in schools, prisons and churches. We are grateful to Claudius for doing a great job promoting Flag Up Scotland Jamaica wherever he went. On the Isle of Arran, he paid a visit to Brodick Castle where he viewed items from the famous Beckford collection funded by profits from slave worked sugar plantations in Jamaica. An article in The Arran Banner here records his reactions. On the next day Claudius’s first school visit was at the island’s high school in Lamlash. Claudius also shared his songs and stories at Kilsyth Anderson Kirk and at Balintore United Free Church in Ross-shire as well as taking part in an interview on East Coast FM for their Reggae show.